Today I'm so happy to tell you girls... Million Dollar Beauty is 1 year old on the internet!!!!! Time flies so fast!!! When I started this blog, the first sponsor I got was from WonderBox. I thought to myself.... there are so many good beauty blogs out there which has better content, more readership and been around for so long. In terms of getting sponsorship, I have no match with all these wonderful blogs. What I did was, I brave myself to write to WonderBox and prepared a proposal for them to consider. To cut the story short, WonderBox agreed to be the very first sponsor! 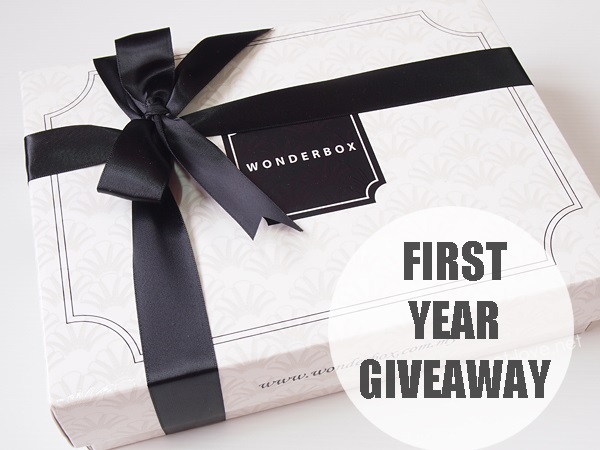 Since this is such a great event to celebrate, so I got back to WonderBox if they agree to do a first-year-anniversary giveaway for my blog and they agreed!!!! This is a special box from WonderBox. You will receive the July WonderBox free subscription and on top of that, WonderBox agreed to put in more products for Million Dollar Beauty blog winner!!! I have THREE (3) July WonderBox boxes to giveaway to THREE (3) readers. I have to steal Fiona's photo because I don't have a nice WonderBox photo with white background. Sorry Fiona, no copyright infringement intended. I know Fiona from blogging. I must say the one year journey blogging has enable me to meet a lot of awesome people such as Fiona. Go check out her blog which is one of the top blog for reviews. She has an amazing beauty blog and she's definitely way much hardworking than me when it comes to blogging. 4. Comment on this post "What improvement you would like to see from beauty box services in general?" (example: include none beauty products as well, more products, more vouchers, better guidance on how to use the products you received, etc.) Just speak out your mind, what you want from the beauty box services. 5. Remember to leave your email which you registered with WonderBox in the comment as well. It would be easier for me to send your details to WonderBox if you win. 1. Opens to residents in Malaysia only. (So sorry international readers, WonderBox doesn't ship out of Malaysia). 2. Last date of entry is 14 July 2013. 3. Winners will be announced on this blog and WonderBox Facebook page on 15 July 2013. Thank you so much for sticking with me in this one year. And thank you so much for reading, commenting, emailing me all the time. I hope through this blog I can get more freebies for you all as a token of appreciation. At the mean time, do enjoy this 3 boxes from WonderBox that sponsored by WonderBox. Good luck. Anyways, the improvement I would like to see is more clarity in how to use the samples sent to us for trialing, and try to make it uniquely products for one beauty box, if not consumers will feel that there is no difference for one beauty box from another. Keep blogging in the future!! 2. Instead of small sample size, the bigger one is better. 3. Variety type of beauty products in one box. One beauty box may have products for lips, eyes, face and hair. I hope beauty box service can give the products according to everyone's (maybe majority only) skin type, hair type, age, favourite colours and more, from the survey that they did (or they should do) from us when we register our account in their website, so that we won't get something that's not suitable for us. Some of the beauty box website, they asked us to fill in our skin type those things, and they will disappoint me cause I thought they will give the products according to the survey list. For example, I have oily skin and I'd mentioned in my beauty profile and I hope to get the mask which they will be giving in that month is for oily skin type, but I always received moisturizing or whitening type of mask, which disappointed me a little bit (but I'll still use it of course XD). What improvement you would like to see from beauty box services in general? I realized quite a lot of the beauty box gave up skin care products and vouchers. I would like to see more cosmetics in the future! There are so many cosmetics around in the market and it would be cool if cosmetics will be included in the future. Wouldn't ask for more because it is cheap to pay for a box full of products wit various sizes. I have never subscribed to any beauty boxes before although I've been contemplating it for awhile. Based on my survey, beauty box service can improve on it's consistency of box quality and also products variance. I have read reviews from subscribers and most beauty boxes are inconsistent. There are months where the items were dissatisfying. This is probably due to repetition of items. I love cosmetics of course but personally prefer more on beauty or skin care products which we can try and "find out" which are more suitable for our skin. I like it when the perfection of the skin before patting on a lot of cosmetics. Besides, I would love to see what are the surprises from the black ribboned Wonderbox!! First thing first, Happy Anniversary to Million Dollar Beauty!Thanks for the giveaway Jerine & WonderBox! What improvement I would like to see from beauty box services in general? I actually quite contented with the products provided by Beauty Box. The only thing that upset me is I realise most of the vouchers or coupons received can only be claimed in KL outlets/branches or shopping mall in KL area. So for those subscribers who are from other states,those vouchers and coupons will be kept and remain unused.I hope the admins can put this into consideration and improve them, lastly all the very best! - To select products which suit our face, hair and skin individually as we have all been asked to fill out a beauty profile. It is sad to receive products from brands we would love to try but found it not suited to our skin type or tone. I know it is hard to fulfil this requests but do try your best in matching everyone’s profile. I, myself have been receiving plenty of deluxe sized shampoo meant for coloured hair when my hair is non-coloured. - As there are many choices of beauty boxes in the market, try not to supply us with products which are the same or from the same brand too much. It is kinda bleh to receive the same products from a few different beauty boxes. Yes, we get bored easily when seeing the same stuffs over and over again. - I do not mind if none beauty products are included in the box as long as they are interesting and good. - It would be great if Malaysia has something like Black Box in Singapore which is free for a limited amount of subscribers. Black Box provides samples of beauty products, non-beauty products and etc for their subscribers to try. Everyone love free stuffs. - Have more vouchers with longer validity period and great offers that we can never say no to. As the boxes are catered to whole of Malaysia, try to give out vouchers which can be redeemed/ used throughout Malaysia. - Depending on the products in the box, ensure that the packaging is ample to protect it from leaks and bumps. - Organize more give-aways and events where everyone can hang out together for fun, discover new products with awesome gift-with-purchase and MOST IMPORTANTLY have FUN again….haha. - In being eco-friendly, I find it alright if all the info is not in printing but ensure that you are able to direct subscribers to the right place (be it the brand’s website or the beauty boxes own websites) where we can get more information on the products and how to use it. - Please do not give one small measly 1ml sachet of sample products. Seriously, I can’t really tell whether it worked or not. We like to try more than one time to decide on its suitability. If the samples only come in sachets, at least provide us with a few sachets of the product. - Full size products are always welcomed. It might be too demanding to have it every month, but at least seeing one full size product every few months sounds great. - Ensure that the courier service used is good. Sometimes, the courier service takes more than 2 weeks to deliver the item which by then my surprise mood is at an all-time low. Save your customers from headache and in turn save yourself from an onslaught of complaints. - It is inevitable that sometimes there will be hiccups. So, good customer service is vital to follow up on any problems that might crop up. Happy birthday to your blog!! I really love your post and review. Very helpful for me. For improvement, I think it will be better if we have well known product, some product that easy to get and available in most outlet other than KL. Those voucher also should be use in all the state. not everyone stay in KL. so sometimes the voucher only can be use in KL so is quite inconvenience for those live outside the state. So far I am very satisfied with beautybox especially wonderbox and mivva. I'm still trying and experimenting all different beauty box. Of course, full size product is a must! hehe. Happy anniversary again to you, Jerine! I would like to comment that beauty box should give products that cover everything. WHat I mean is the products should take care of our hair, face, skin, make up. Sometime the contents of beauty box just stick to one categories (eg: Face). Beauty is something holistic so I would like to see improvement in this field. Hmm... as to what I'd like to see improved in beauty boxes.. I would suggest more products becuase i love to try before buy. 4. Since beauty boxes are mostly surprised box, I actually wanted to know how much full sized products they will gave out in every months box so that I can know that I invested to something good. If they could be able to tell what brands for the month, that sure will be helpful. i have completed task 1, task 2 and task 3 so now it comes to my suggestions for beauty box services in Malaysia. 1. It is awesome if subscribers can get a box full of products that really suit her needs. For example, I have dry frizzy hair yet I received a bottle of volumnizing shampoo, which I can't really benefit from based on my hair condition. The way to solve this might be by having subscribers filling in a beauty profile upon subscription. Even though it means extra work for the beauty box providers, where they have to sort things out in detail according to each customers' preferences, it worth the effort coz in return they will get permanent/satisfied customers who will surely tell others about how good the beauty box brand in satisfying their customers' need. 3. Quality of the box is also another thing that must be taken care of. Who likes receiving dented beauty box? It's like receiving a present that has been trampled by a riot. So please, to beauty box providers, use sturdy boxes for your customers to ensure the product's safety and customers' satisfaction. 4. Spill-prone products especially in liquid forms should be wrapped with a plastic packet and also bubble wrap for all products. It is not fun to receive a box drenched with leaked products. 5. Most of the vouchers can only be used in KL/Selangor. So, what's in for subscribers in other states? It is better to give discount vouchers that can be redeemed online rather than specifying that it can only be used in KL. Or why not substitute the vouchers with sachet size products that we can use while travelling. 6. Sachet size products are not enough for subscribers to test the effectiveness of the product. If beauty box providers want to give out sachet sizes as the main product in the box, please do not give only 1 sachet unless its a 5ml body lotion then it's okay. Congratulations on your 1st anniversary! Before I started blogging and have my own blog I have been an avid reader to your previous blog! <3 Keep on blogging! 1.Lower down the numbers of skincare products. Especially when they come in sample. Its pretty hard to include in your daily everyday basis skincare regime. 2.I prefer travel size than sachets size. 1.prefer deluxe sample size than sachets as I could not realy see the results with jus few sachet..another way is by giving a stack of sachet which is similar to the qty of a deluxe size sample. 2.create a profile where member can fill up the skin and hair profile so that they receive product suits to their skin and hair type. 3. monthly theme is fun and keep us surprise, could even add some cute packing to match the theme. 5. If item is wrap individually in the box it will make more suprises..
7. Use a more reliable courier company for delivery to ensure on time delivery and box is in good condition. 9. good customer service is a must..Be responsive on any enquiry will leave good impression to subscriber..
well actually suggestion can go on and on..but somehow also need to justify against the fee we pay so I guess at the end of the day just need balance up every factor. lastly hope I could win a wonderbox as I have never tried wonderbox before..fingercrossed..
Wow Hip-hip Hurray! Happy Birthday to your Blogsite! Didn't know it's 1 year old. Actually it's from your site I've made decisions on some beauty box(es) during the intial stage of the beginning of Beauty Box era in Malaysia. 2) Good customer support service (not immediate 24/7 but within 2-3 working days response will be nice. 3) Expiry date (not within 1-3months). Due to the humid weather locally, most cosmetic/skincare product start to expire/react within those period so those with sensitive skin might not be able to utilize those product & have to rush to start using it. 4) Product booklet/manual/simple graphic illustration/Youtube link will be nice. Since most of the Beauty Box have their "ambassador" ask them to do a visual demo on how to use & select those good ones and compile into a nice newsletter instead of posting it perodically all over the place in Facebook. 5) Reward those that provide good reviews & step by steps. And mark them as "recommended reviewers". 6) Minimize to one brand for sachets. Too many sachets for many brands, that's like no difference comparing to gathering it from the beauty counters in the malls which are free. I prefer quality rather than quantity. Min.2 travel size & 1 full size. 7) Makeup tools e.g. various types of brush, comb, eyelash curler, cleaning tools = that's a plus point. Definately a unique selling point. 8) Additional vouchers e.g. beauty workshop, mini facial/manicure, buy 1 free one, movies, treats instead of discount vouchers will be great. Most of the discount vouchers in the boxes currently can be obtained from the magazines/online or even current walk in to the store. 9) Durable & usable boxes so can reuse. Different themes are great but no need for it to be every month as the printing charges will be higher. Better put it into an informative description/menu card. LOL I hope that's not too long. That's my personal thoughts after using 5 local beauty box brands. P/S: Gambateh to your blog! "What improvement you would like to see from beauty box services in general?" 2. more point rewards systems by eg : subscribing the box or referring to someone or writing reviews of the products....it also motivates bloggers to blog more! 4. Speaking of east malaysia, i hope that there is a supply to east malaysia, i believe a lot of the beauty junkies that drooling over the box we have here! 6. I wish that the courier service can be better...have encountered some very idiot courier guys that never call when i am not home to collect the parcel. Oh btw, congratulations on your blog one year anniversary! and thanks for the giveaway!!! Congrats on ur 1st blog anniversary! Thank you so much for the hard work to give us awesome giveaway n good reviews on products. I hope that beauty boxes company can cater the products according to the need of the recipients. Make good use of the quiz they made us take in the websites. For eg: if there is a foundation product in that month, then categories the products into dark, medium and light and then send it out accordingly. And for skin care based products, maybe categories it into dry, sensitive, oily and normal skin. It might be harder work for them to pack, but it would make the experience to buy from them so much more rewarding and stretch every penny of the money spent. I reckon the buyers will come back more often. I would like to see if Wonderbox can have vouchers that can be used in East Malaysia. Maybe you can include some make up tools too. I hope that the vouchers can use at East Malaysia. Besides that, it would be nice if Wonderbox can give accessories as gift or surprise during the month. Last,try to avoid give any sachet but deluxe sample. I would like to see from male up brand or some best seller skin care. Sample kit its okay because we can try it before purchase. Completed task 1, task 2 and task 3. =D Here is task 4. 1. I found the vouchers include in beauty box is totally useless for me because most of the vouchers just available to use in KL and Selangor area. I live in Perak and i am not able to drive so far just to try out the discount vouchers. I hope the discount vouchers can be convenient as possible example like give discount vouchers that can be use at Sasa, Watsons and Guardian. And consider their subscribers that is from north or south Malaysia and East Malaysia too! 2. Maybe can include some make up tools? 3. Hope cosmetic products can include in beauty box too. First and foremost, Happy First Blogiversary Jerine! Generally the beauty boxes in Malaysia are nicely done. Each have their own different color schemes, themes and objective. While there are plenty of room for improvement as mentioned by other readers comments before me, there is one other thing I wish to add and do hope the Malaysian beauty boxes companies would consider greatly. Birthdays and anniversary (or Blogiversary) are like milestones for all of us. Celebrations are almost always a must and along it presents. We know these beauty boxes are like presents itself and they are issued on a monthly basis. I wish to suggest if ever possible, include an extra item or two in the box when the subscription falls on the birthday month of the subscriber. So on your birthday month, you can look forward to receiving an extra gift in the box packed exclusively for you. It is very much like other membership cards where you get double points on your birthday month or a free gift. At the very least, you can be sure to always look forward to that one specific month in a calendar year to be pampered from head to toe! Happy 1st year Blogsary.. I've been reading your posts and I truly enjoy reading them and got inspired/advise from it. I was exposed to this beauty boxes since Michelle Phan introduced the "Glam Bag" in US and I was so Heartbroken because its not available in Malaysia. After reading your posts on Wonderbox sometimes in January 2013, I went to their website and subscribe them for trial and I was very happy with the products featured. My first beauty box was in February 2013. Since then I never miss to get their box every month. 1. WOW Impact - I noticed subscribers love to be surprised with unexpected items/products. Deluxe sizes, premium brands, sometimes full items, not limited to only skin cares but also to include make up and accessories. The products featured in the beauty boxes showed how strong is the owner relationship with the suppliers. This would convince your subscribers to continue support your boxes. 2. Service Level / Public Relationship between beauty boxes provider and subscribers. Do take note that subscribers are also customers. Please ensure to take care them more because at the end they also plays the role to ensure your business is in order. This includes on responding to their comments, emails, request,improve on the delivery service,ensure the packaging is in order (to avoid leakage), these areas need to be taken care of. Nobody like to be treated like nobody. Although most of subscribers are so quiet (they are not blogger - silent buyer), but somehow they would also would love to associate with other subscribers/blogger in any beauty event. Do invite them and do not limit the event to blogger only. They should have been given a chance to expose on this type of event such as product launching, skin care treatment, workshop etc. This way, customer/subscribers feel appreciated and would give better support to you. 3. Do more research - As a beauty boxes provider, you should do more research on trends and finding the right products to be featured in your box. You must remember, your subscribers do not only subscribe to your box. They also subscribe to others (your Competitors). Do read their comments and reviews about other beauty boxes. No One would want to see same samples/products in 5 different boxes on that particular month. They want varieties and diversity.. Always remember; by creating WOW effect to your subscribers would put you always at the TOP. Thats all my 2 cents.. Really hope that my comments would be considered. I would love this Beauty Boxes trend continue as it really helps beauty junkie like me decides what is worth to buy. Not joining but wishing you a happy 1 year anniversary! Although Million Dollar Beauty has done a very excellent job so far, I would suggest some recommendations to make it even much perfect! First of all, it would be great if you can include more full size beauty products and less vouchers as they are usually just put aside until they are expired, especially for students like me who do not have spare cash to spend on expensive beauty products even after the discounts or vouchers or whatsoever. Secondly, I think you can give away some samples or free gifts to those who subscribed, to try on the latest beauty products which will be included in the coming beauty box so that they can decide whether the products contained in the beauty box suit them, or not. It can promote the products at the same time attract the subscribers to purchase the beauty box as well.Besides, it builds stronger confidence on both the blog and beauty products, frankly speaking. Next, when speaking of the brands of beauty products or cosmetics, the first thing people might think about is price, then only the effects and quality. Hence, I would suggest you to promote beauty boxes of different price levels, which contain of different products of different brands for all levels of the consumers. For instance, Beauty Box of $199 which contains SKII, Chanel, etc and Beauty Box of $19.9 of the products such as In2It, Silky Girl, Za, etc..
Really enjoy reading updates from you blog, just like how I also always follow Fiona(streetlove)'s post regularly! 1.service. most importantly, I feel that interpersonal service (like replying emails, being personal, courtesy) is most important. Customer is king, and if I don't feel happy, I won't buy, no matter how great the products are! 3. just like everyone else, SIZE matters. I mean, 1 sachet of cleaning gel? come on...I pay at least RM40 just to get a measly sample I can get over the counter? Thats why I love beauty boxes like Wonderbox because they always try to include full sizes. Imagine your face powder in sample size. Can only apply one side of the face..Horrible right? my suggestion for beautybox is this, i noticed that the same samples or items make their rounds from one box to another. do the beautybox companies approach the same brands? It's a pain to be receiving the same items again from a different beautybox. also of course full size items are always great. i also like how some boxes do events with the brands so bloggers could attend them. Happy Anniversary to Million Dollar Beauty and may you having many future successes. In this competative market to share a piece of cake is harder than imagination. But since it is a gift collection business and the targeted person are ladies, it is much more easier. Every woman has a girl heart. We are desirous, envious and jealous.We would like to be treated as princess and owning variety of beauty accessories (especially full size items or deluxe size). Sometimes we will be lack of interest if we continue owning the same thing. We love to be care and spice up with little surprises. All in all, beauty box - It's a girl thing.